Discussion in 'Frontpage news' started by Hilbert Hagedoorn, Sep 14, 2018.
jura11 and chispy like this. Something like this will be what most people would get for a powerful rig, but it still has that desperation aftertaste. If AMD decides that their 7nm building block is 12 or 16 core for Zen 2, this will be more or less DOA for people with common sense (ie, people without 144Hz displays. Also, people with 144Hz displays, I hope you realize that they are not for generalized use). tunejunky, RzrTrek and chispy like this. 1.248V idle and 1.28V full stress cineb??? fantaskarsef, -Tj-, Duke Nil and 4 others like this. 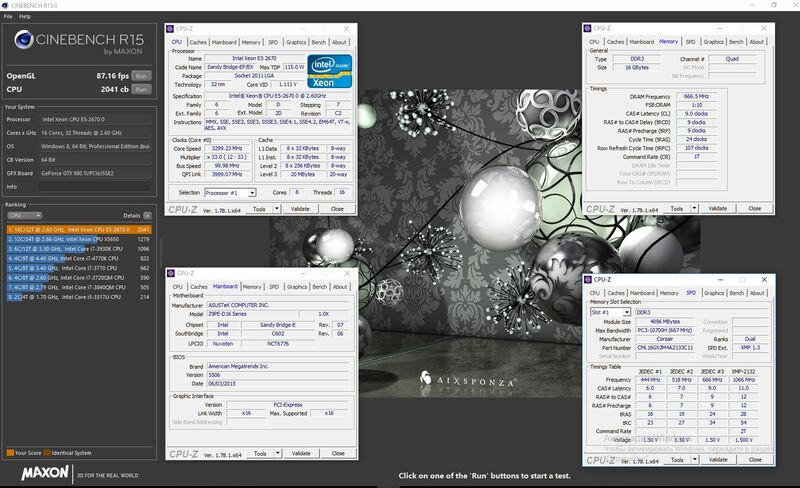 i9-9900K stock is only 5 GHz on a single core. Meaning it's running 4.7 GHz in CineBench, all core clock. Wait till people are running this chip at 5.2-5.4 on all cores. You'll see much higher CB results + 230-240 ST result. Ryzen is 180ish here. Big part of why gaming perf is so bad on Ryzen. Single thread performance is on Sandy Bridge / Ivy Bridge level. CineBench does not represent real world usage. 8700K already destroys 2700X in most workloads and especially gaming. Even i5-8600K shits on 2700X in games. Besides, 4650 MHz on Ryzen is hardly 24/7 stable. ^ Gotta be throttling back because of the heat then. I mean 5 GHz on 8 cores on that size of chip, even with solder, is some going. BReal85 and -Tj- like this. ^ That would mean the IPC are about the same! Come on AMD I want Zen 2 NOW! fantaskarsef and chispy like this. Doesn't the video show 5 GHz across all cores? Fox2232 and chispy like this. Curious about the price of these. I want to upgrade my haswell. Also wanted to give a chance to AMD, but the upgrade would cost me more with AMD and it's slower. ?? Do you live in an alternate universe, AMD dearer than Intel? A 2700x cost 30 Euros less than 8700k, MB is about the same, but ryzen need faster Ram, b-die samsung cost 80 Euros more, my existing archon sb-e x2 is not am4 compatible, so more 60 for a new good cooler. fantaskarsef and jura11 like this. did you took your time to at least check the screens or the video? The 8 cores were running at 5ghz all the time as reported on CPU-Z all cores were boosting to 5ghz stable. The only scenario where the i8700k beats the R2700x is gaming at 1080p. You can compress faster on the i8700k but thats it. tunejunky, -Tj-, xIcarus and 2 others like this. Nothing really surprising here. I'd like to see what cooling solution they used - nothing less than a 360mm CLC, probably would be pushing that pretty hard to get an 8-core 5GHz clock on what is essentially optimized Kaby Lake cores. And then there's the price. They wouldn't have renamed what was the i7 to i9 if they weren't planning a price hike. I wouldn't expect these to retail for less than $450, and I am leaning towards closer to $500. Not getting into the all that but I'm betting 9900k is running default jedec speeds. The only scenario where the i8700k beats the R2700x is gaming at 1080p. We all know that's not true. Not to mention that CB R15 score is almost unaffected by memory clock. This ryzen gen doesn't really care about ram that much. My brother got a new 2600x with random cheap 3200 ram, and it all worked just fine on the first try. The IPC had been very obviously the same since launch. Intel seems to be stagnating really hard. Also, your 4.6Ghz CPU is an outlier crispy. I am very curious to see how mature nvidia drivers for Turing will behave with ryzen. The current ones seem to be crap. With leaks like this, and even full retail reviews, why doesn't anybody run the single core test? That is more important to me than "oh, they added cores so the big number gets bigger" kind of stuff everybody shows. Is the 9900k going to be 200cb single core stock? 230cb stock? 240cb OC? 250cb OC? This is what determines whether I purchase a new CPU.